Is Djokovic's Downward Spiral Rooted in His Unrequited Love for Fans? It is not often that the loser of a match nudges the winner out of the headlines, but Novak Djokovic did just that last Sunday in Rome. After losing to Alexander Zverev in the final of the Italian Open, Djokovic announced in his post-match press conference that Andre Agassi would be coaching him at the French Open, news that relegated Zverev’s maiden Masters 1000 title to an afterthought. Djokovic, of course, has been in a bizarre slump since winning last year’s French. In December, he split with Boris Becker, who had coached him since 2013 and helped guide him to six of his 12 majors. Earlier this month, on the eve of the Madrid Open, he fired the rest of his team, including longtime coach Marian Vajda and his long-serving fitness guru Gebhard Phil-Gritsch. To bastardize the Bard, this has been the winter of Djokovic’s discontent; can it now be made glorious summer by this son of Vegas, Agassi? Hard to say. For one thing, Djokovic and Agassi are still in the courtship phase. Djokovic said that Agassi will be with him in Paris, but not for the full two weeks, and that based on how things go, they will then decide whether or not to make it a permanent union. It would not be entirely surprising if this turned out to be a one-and-done thing. Agassi has never expressed much interest in coaching, and given that he has a young family and a thriving second career as an education entrepreneur, you have to wonder whether he really wants to spend a significant chunk of time sitting in the players’ box—or if he can give Djokovic the kind of attention the Serb is presumably going to want. And what does Djokovic hope to gain from Agassi? What exactly is the problem Agassi is being asked to help solve? That is the really puzzling question. As sudden and baffling as his recent downturn has been, Djokovic is still a guy with a dozen majors to his credit. There’s no obvious technical or strategic flaw in his game. Maybe it’s a confidence issue, but Djokovic has dealt with lapses in self-belief at other points in his career and has always rebounded. It has been suggested that his motivation has flagged since winning the French and completing a career slam. There has been chatter, as well, about personal issues. If the problem is focus and drive on the court or turmoil off of it, what solution could Agassi possibly offer? 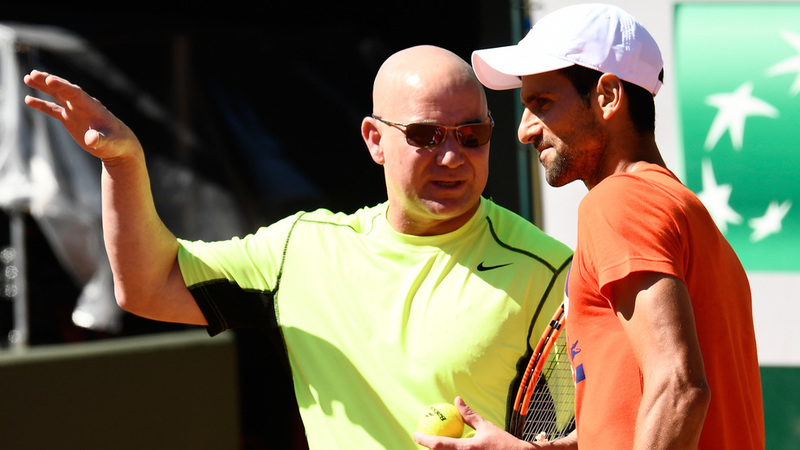 But it could be that Djokovic has enlisted Agassi for an entirely different reason. A few months ago, I wrote about Djokovic’s struggles and suggested that maybe part of what is bothering him is his failure to win over the crowd. With apologies for quoting myself, here’s what I wrote. “This is purely speculation, but perhaps he has also grown frustrated at his inability to win the thing he seems to covet the most: the affection of tennis fans. For years, he has tried—too hard sometimes—to be a crowd pleaser, to charm spectators and to gain not just their respect, but their love.” Djokovic clearly longs to be embraced by the fans, and it must surely gnaw at him that no matter how hard he tries, they continue to keep him at arm’s length and to deny him the same adoration that they lavish on Roger Federer and Rafael Nadal. It’s not that Djokovic is disliked; it’s just that he isn’t loved, certainly not in the way that Federer and Nadal are. No doubt, part of the problem is his style of play—it is bloodless, clinical tennis, worthy of respect but not so easy to warm up to. Djokovic was also the guy who crashed the Federer-Nadal rivalry and soon usurped both of them, and I suspect that a lot of fans have never stopped seeing him as the interloper. Whatever the explanation, he just can’t seem to get the affection that he craves. No matter how much he achieves; no matter how graciously he conducts himself (and no one in men’s tennis is more gracious in defeat or magnanimous in victory); no matter how approachable and engaging he is (I watched him hit with a young kid following one of his practice sessions at Indian Wells this year, and he couldn’t have been nicer to the kid or more playful with the crowd)—it just doesn’t seem to make a difference, and I have to think that this bothers him. A lot. The hostility of the crowd when he played Federer in the US Open final two years ago must have stung. Ditto the way spectators turned on him when he played Stan Wawrinka in last year’s Open final. Is this the sole cause of his downward spiral? Maybe not, but if the problem is motivation, it is entirely possible that it is rooted in unrequited love. So how does Agassi fit into this? Like Djokovic, Agassi struggled for many years to win over the crowd. He was a showman, but fans didn’t find him particularly endearing. A lot of people thought that he was a phony (some have leveled the same charge against Djokovic). It was really only in the latter stages of his career—starting after he unexpectedly won the French in 1999 to complete his own career slam—that Agassi became the adored figure that we know him as now. Maybe Djokovic finds inspiration in this; maybe this is part of what drew him to Agassi. A guy entering the latter stages of his own career and desperate to feel some love from the audience could do worse than to have Agassi in his corner (it is fair to say that Djokovic’s former team was a stone-faced crew that did nothing to soften his image). I am not saying that this is the only reason Djokovic reached out to Agassi, and it might not have been a factor at all. But it seems as plausible an explanation as any other that has been offered for this unlikely pairing. Editor's note: Mike Steinberger is a journalist based in the Philadelphia area. He has written about tennis for The New York Times Magazine, The New Yorker, Vanity Fair, and the Financial Times. The views expressed are his own.